December is just round the corner so I am very busy making new pieces for the website. I am particularly interested in evening wear at the minute as it is what people are demanding right now for Christmas. I just finished several pieces including a stunning 30s/40s lace gown and a dramatic velvet pencil number with a breathtaking lace piece going across the chest. I will post them here as soon as they go on the website. It is for auction! The starting bid is from $2000 (not cheap) on liveauctioneers.com (this is the link, in case you want to have a quick nosey). This is the description: 900. 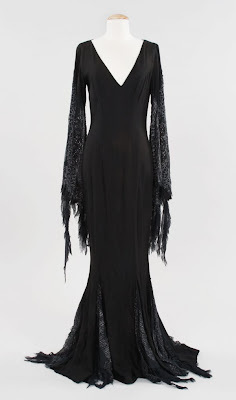 Angelica Huston "Morticia Addams" dress from Addams Family Values. (Paramount, 1993). A full-length form-fitting black gown with cobweb motif on the sleeves worn by Angelica Huston in the role of "Morticia Addams" in Addams Family Values. This dress looks fantastic. Much simpler than I thought, despite all that beading work on sleeves and godets. However, I have to say, being a cinematographic piece, I was expecting something more complex and extravagant, more haute-couture- inspired, like the other design shown in the pic below. Maybe, layers of lace, ripped/unfinished chiffon, jet black jewels sewn into the bodice?... I still love it, thought. I always wanted this dress, since I was little. I love the shape, so 30s. I am starting to wonder if I should make something like this for my label. What do you think? Do you like it or like me, expected more? Would you wear it to outside of Halloween or Whitby/Treffen Gothic Festival? 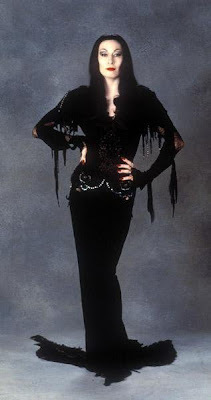 Here is a link to a blog devoted to Morticia Addams. Very good pictures and graphics. I haven't been posting regularly as I should. (Sorry). But I have been so busy with both the website and the studio that I haven't had the chance to sit down and write my updates. Next weekend there is going to be a crafts market in Liverpool, called Winter Arts Market. It will be in the same St George's Hall where the Liverpool Design Show takes place too. I will be trading on the Sunday the 4th. I have never been in this market before so I am really looking forward to see what is like. Juding by the photo from last year, it seems to be a very popular market! I will be selling my jewellery, not the clothes. Click here to see my facebook page for more details or become a fan of my BlackWardrobe!